This review is about 5 printed pages long. The development of ideas of perspective in the Renaissance was as much about the subject viewing the painting as it was the subject of the painting; fixing positions between viewer and viewed in relation to the work and the world. Lee Harwood, throughout the Collected Poems, has difficulty in getting things in perspective, the Welsh mountains appearing and reappearing through the rain, their proportions glimpsed through mist or dancing in a summer’s heat haze. In the preface to ‘The Long Black Veil’ the ‘year passed’ has only left him with more questions: ‘How do we live with this?’ and ‘What have we left? (CP 168). ‘A year of silence’ in the more recent poem ‘5 Rungs up Sassongher’ has resulted in ‘an imagined sea’, with ‘sheets of blank paper covering / the heaving waves’ (CP472). Yet his response is not simply a movement from a Renaissance sense of perspective to Cubist collage, as if he goes from a single fixed relationship between subjects in the poem (of which the poet’s subjectivity is only one) to multiple relationships. Nor is it an attempt to discover a real and essential ‘self’ in the fragmentation of the modern world (although the desire for and the process of moving towards resolution or completion or a feeling of wholeness is important, albeit one whose culmination is never really desired) but rather a series of fleeting relationships which lead out of the poem to ‘somewhere else’. Harwood’s contribution to dinner party conversation would, I imagine, as often be a softly spoken aside or a waspish jab, as an attention grabbing anecdote. He inserts himself quietly into any situation, listening and touching as much as talking. And when he steps back to get a better look at things, often seems to find himself in mid-air, as if he’s stepped backwards off a ladder or sawn off the branch he was sitting, removing the framework he has carefully constructed around himself. The life is supported by a cat’s cradle of multiple connections that are carefully constructed yet repeatedly questioned. The poem ‘Cwm Uchaf’ (CP408) begins when ‘someone yells from a window / down into the dark street’. This situated and contemporary activity is set against the imagined space and timescale of the moon where ‘in a vast barren crater / a rock very slowly crumbles’. Referring to the death of a friend in a climbing accident, the poem draws comparisons between the importance of the ‘here and now’, and its unimportance in the finality of death which severs all connections. It moves from ‘A fuzz of stars’ which ‘sweeps across the world’ as a visual phenomenon which is ‘partly known and unknown’, to the specific and detailed location of a skull imagined as a ‘fragile bone sphere cracked and shaky’. The fall of the body, ‘tumbling down’, is compared to the feelings of the survivor and his ‘stumbling descent through the day’s maze’ and the abstract visual images of the night sky become a symbol for the acceptance of the dead body into all space and all time in the ‘stars arms remote embrace’, before the detailed and located imagery of the drops / of rich red blood’ and the physicality of the ‘thick orange bag on a hospital trolley’. The sense of physical presence, of the haptic experience of ‘thick’, is immediately set against the redemptive visual, a necessary removal from the immediate pain of death and a shift of focus away from his inner sensations, to ‘The faint glitter of the rocks mica the sky / catching the eye’. The poem returns to its starting place in Brighton, where ‘the waves’ are ‘going nowhere in particular’, and are compared to the loss of blood in ‘a gradual leaking away’. Through his combination of visual distance, and the sense of embodied presence, Harwood is able to combine both the physicality of death and the intellectual and emotional response to that death. He can say ‘this is what it looks like and how it feels’, and simultaneously ask ‘what does it mean’. This shifting between times and place, and shifting perspectives, mirrors both Harwood’s own life and his position within the poetry. While in the minds of many connected to ‘New York’ poetry, and Ashbery’s description of him as one of ‘Britain’s best-kept secrets’ re-appears on the Collected Poems, and to ‘writers forum’, a London based collaborative network of performing, publishing and workshop activities centred around the figure of Bob Cobbing, his background also includes a sustained interest in European poetry. His first translations of Tristan Tzara appeared in 1971 and a revised edition appeared from Black Widow Press in 2005. Harwood’s work is equally difficult to place within any particular tradition, both as individual poems and as a collection across time. It is neither a poetry of ‘place’, nor part of the asyntactic experimentation of a politics of form, although it has echoes of both, nor any kind of mid-point between these approaches. This does not mean Harwood is unselfconscious about form, or the social and aesthetic functions of language, but that because his poetry is rooted in an investigation of an experience of the world as it can be known, and how that experience is ‘represented’ back to ourselves, he can never, for long, remain abstracted from that world. Harwood’s work is highly ambitious in the way it seeks to engage with the messy contradictions of embodied experience, including the experience of language, and the multiple but limited perspectives those contradictions provide. The cool beech woods on late afternoons. and this only a description of my love for you. The irony is that the poet meticulously arranges experience into formal poetic language, and, like a scientist, lists the different features of the rural landscape as viewed from the scientific and ‘proper’ place of distance. Yet all he ends up with is ‘only a description of my love’ and not love itself. Another poem, ‘Just Friends’ begins at some distance from its subject: ‘Two men enter a Victorian house in Kensington and view a recreated Arab courtyard and a series of indifferent paintings’, and ends ‘At this moment I feel close to tears’ (CP 298), moving from a visual distance to an emotional connection. Like Lefebvre, Harwood is aware that understanding is not entirely located in abstract conceptualisation, or only found in situated and embodied experience, but in the movement within and between, and the variety of possibilities that opens up. He describes the writing process in these terms in the first two stanzas of ‘Winter Journey’ (CP 365) where he combines an account of movement through space with the movement of the poem on the page. all white with frost along the railway embankments. into the open air and you. All worth it. All perfect. Page. The abstraction of the ‘white page’ is muddied by the physical experience of travelling. Travelling, moving through space at ground level, is compared to the process of writing. The total journey is not clear from the start, there is no perspective from which he can get everything in proportion and to scale, but rather a physical process of moving from word to word, and from place to place, only infrequently raising his head to get an idea of where he is. The culmination of the writing process is the perfect poem, addressed as ‘you’, and the journey is made perfect by emerging from the journey and the writing process to the person ‘you’. Experience, for Harwood, combines the physical and conceptual; in ‘September Dusk by Nant Y Gueallt’, smell is augmented by touch and ‘The scent – bog myrtle’, comes from a plant which is also touched and ‘brushed through’. The ‘flat moor – the colours muted’ provides ‘A sense of calm … the silence’ (CP 397). The idea of brushing through vegetation is echoed in the later poem, ‘Five Rungs up Sassongher’, when he quotes Darwin’s diaries in the fourth section aptly entitled ‘Touch Stones’: ‘“… the plants and shrubs possess strong and peculiar odours; even one’s clothes by brushing through them become scented.”‘ (CP 477), a poem which begins with the a loss of contact with the world and in which ‘all becomes simile’ (CP 472), but ends with a physical performance entitled ‘Dolomitic Ditty’ and whose final line is full of awe and wonder at the physical world, repeating the line ‘“brushing through them”‘. Harwood is not alone in questioning the contemporary relevance of the procedures and poetics of a poetry of place, while simultaneously registering the importance of places. Alice Notley in the poem ‘Go In and Out the Window’, from her autobiographical collection Mysteries of Small Houses, says the poem is ‘not mine, I / want it but have to go in order for it to live / or go in and out / of it “and see what we can see”‘; through shifting perspectives the poem examines relationships between place and identity, and author and poem, yet its conclusions remain fluid across both space and time. Identity is never fixed, but located in the movement, and in Notley’s case in and out of the window, in a transitory space between places, and between inside and outside and even ‘in and out of / species even tongue of grass or fire’. By refusing to identify with any fixed geographical place, yet acknowledging the importance of places, the poem itself becomes a place, albeit one that is conceptual rather than physical. Harwood’s poems are similar in their intent, where the poem becomes the place of negotiation and discussion between a conscious critique of the world around him and an embodied experience of that world. In the prose pieces in this collection he frequently draws on characters from a mid twentieth-century English childhood, and familiar figures appear and re-appear. The characters and settings in the stories provide a context, although the rapid shifts of genre and breaks in the narrative are processes that ultimately draw attention to the stories as formal constructs, and critique the very context they draw on. Many of his prose pieces are more socially located, as if the detailed exploration of relationships between landscape, identity and language belong to the more isolated activities of walking and climbing in the countryside, and the third person characters and narrative structures allow him to explore political ideas in more detail. Harwood’s poetry makes few claims for itself and rarely raises its voice. A casual reading might focus on the more sentimental aspects of the work and the occasionally breathy awe at nature, or at romantic love. Like many experimental late modern poets, the success of Harwood’s work is difficult to locate in a single poem, but needs to be read across his collected works to appreciate the subtlety of distinctions between the ethics and aesthetics of the multiple, and the desire for the ‘complete’. His engagement with experience, although often apparently local to the place, whether that place is the human body or geographical, is stubbornly internationalist, yet his perspective is from the ground up. As Harwood says in ‘Take a Card’, the final extended series of poems in the Collected Poems, ‘Being one of Life’s Corporals I know/my place in the scheme of things’. The breadth of the work in the Collected Poems demonstrates that this place is not one of limited perspective but of restless experimentation. 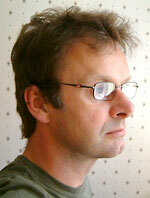 Ian Davidson has recently published poetry with Shearsman, West House Books and Spectacular Diseases. His next collection, As if Only, is forthcoming from Shearsman in late 2006. Poems from that book can be seen at http://jacketmagazine.com/30/davidson.html. A critical book, Ideas of Space in Contemporary Poetry, is forthcoming from Palgrave MacMillan in May 2007. He lives in north Wales, Europe, and teaches literature and writing at the University of Wales, Bangor. Copyright Notice: Please respect the fact that this material is copyright © Ian Davidson and Jacket magazine 2006; it is made available here without charge for personal use only, and it may not be stored, displayed, published, reproduced, or used for any other purpose.